Stamp Kissing is a technique that has been around for a long time but it's something I haven't done in awhile and I thought these birthday cards would be the perfect time to revisit this fun technique! The balloons from the Simon Says Stamp Birthday Balloons Stamp Set and the Pattern Swatches Stamp Set make for awesome textured birthday balloons and the brand new CZ Design Birthday Palooza greeting stamp set is the perfect compliment to the design. I started the card design by building the backgrounds with the large sentiment first. 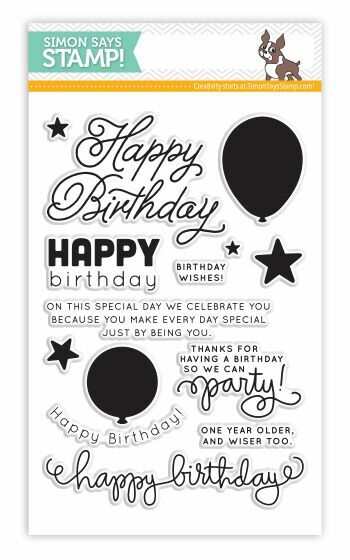 The large outline font greetings from the CZ Design Birthday Palooza stamp set were stamped on Bristol Smooth Cardstock using Versamark Ink and heat embossed with white embossing powder. Tumbled Glass Distress Ink was lightly applied all over the background panel, keeping a lighter hand near the top of the background. I didn't intentional try to not in the greeting but I did try to keep the majority of the ink around the greeting. Zig Clean Color Real Brush Markers will cover up any of the light blue color. I spritzed the background with water from a Distress Sprayer and blotted it dry with a paper towel. I colored in the outline greeting with Zig Clean Color Real Brush Markers, watered down with a water brush pen. The embossed outline helps hold the watercolor in place. For the balloons, I first stamped the solid balloon image from the Simon Says Stamp Birthday Balloons Stamp Set with Distress Oxide Inks. To give each balloon a pattern, I inked up a Pattern Swatches pattern and "kissed" the pattern to the balloon image to transfer the ink to the balloon and then stamped the pattern over the solid stamped balloon image. I love this technique for adding a pattern to an otherwise solid image! If you have larger solid images, consider using your larger background stamps to add a pattern to a solid stamp. Solid balloon strings were added with a fine tip black pen and a ruler. Each background was die cut with a Wonky Rectangles Die to give each a decorative stitched border. Greeting phrases from the CZ Design Birthday Palooza were stamped on black cardstock with Versamark Ink and heat embossed with white embossing powder. The greetings were trimmed into thin strips and adhered to the card with foam adhesive. A scattering of Nuvo Crystal Drops adds a "confetti-like" look to the design and an extra pop of whimsy and color!